I found StackOverflow articles on nested objects and environment specific AppSettings.json configurations but this does not appear to be the answer. I read that a web.config file must exist for ASP.NET Core apps to work under IIS. Update 2: A.F.A.I.K, web.config can be loaded from the app content root, but the one we need resides up in a virtual directory. A AspNetCoreModule maintainer told me environment variable inheritance (which applies in this scenario) is unreliable, and no plumbing exists to access other inherited configuration. The web.config only exists to configure IIS for ASP.NET Core applications. 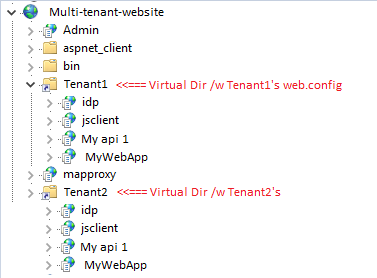 tenant1 and tenant2 are virtual directories containing a tenant specific web.config, so invoking https://myfqdn.com/tenant1/myapp loads tenant1's web.config and myapp inherits its settings for requests. /tenant2/myapp loads a different web.config. Myapp is unaware of which virtual directory it was invoked from on each request. We install myapp in one physical location but add it as an application under each tenant's virtual directory. The result is we have one copy of the app, multiple instances, and no multi-tenancy plumbing. ASP.NET Core is not bound to IIS so the same approach won't work as for ASP.NET. But you can implement a similar approach if you would like by moving your common settings to some SharedSettings.json and use this. Not the answer you're looking for? Browse other questions tagged iis asp.net-core web-config or ask your own question.